The onset of Spring is enough to make any Scandinavian giddy, and I happily join my fellow Vikings in anxious expectation of the return of some actual daylight, warmer weather, and being able to leave the house in lighter clothing. With the approaching light, I am always inspired to do make-up. Doing your own make-up is fun – you're in complete control of color, coverage, ingredients, and best of all, you have a unique product that is truly your own. If you want to give this a try, choose one thing you want to make and start with that. If you end up unsatisfied with the result, you're an experience wiser and haven't spent a fortune. But if it does capture your interest, you can build from there. Here's how I did a pressed eyeshadow the other day. I always end up mixing more pigments than I need at any given time and have a selection of different pre-mixed shades that I store in little sample jars. (Always a good idea to write some kind of color description on the lid so you can easily find what you're looking for). 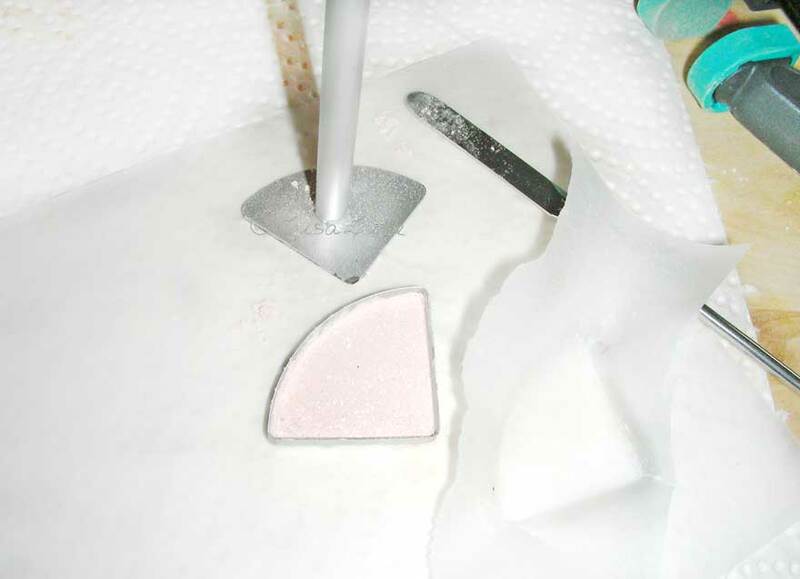 The color pigment needs to be mixed into a base powder blend. 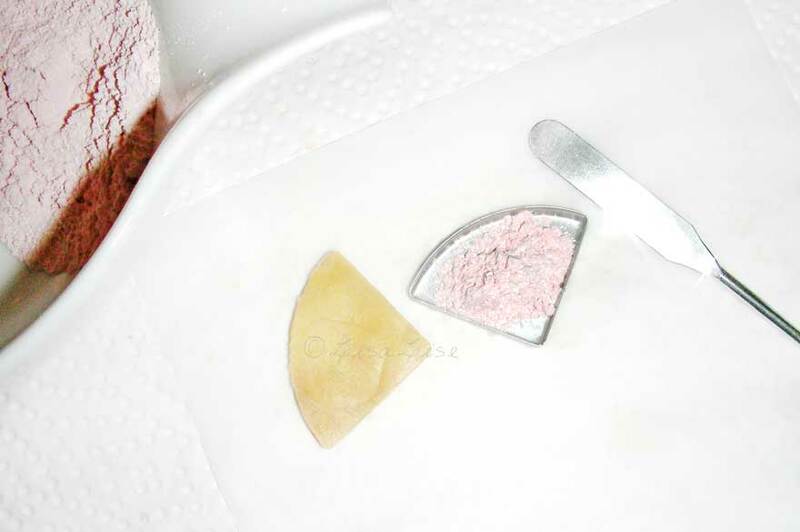 It is possible to buy a pre-mixed powder base specially for pressed powder. How do they work? There is just the correct amount of binder added to the mixture that helps everything bind together when pressed – a little like how pie dough works (without the water). 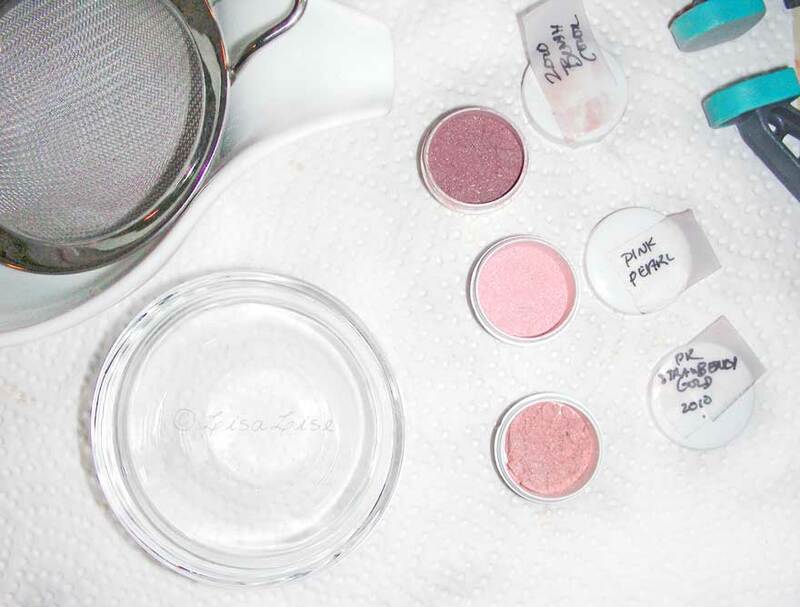 I tried one out last year and must admit they're so much easier (and faster) to work with than blending your own base – and if they're made by a conscientious company, then you're in the pink. 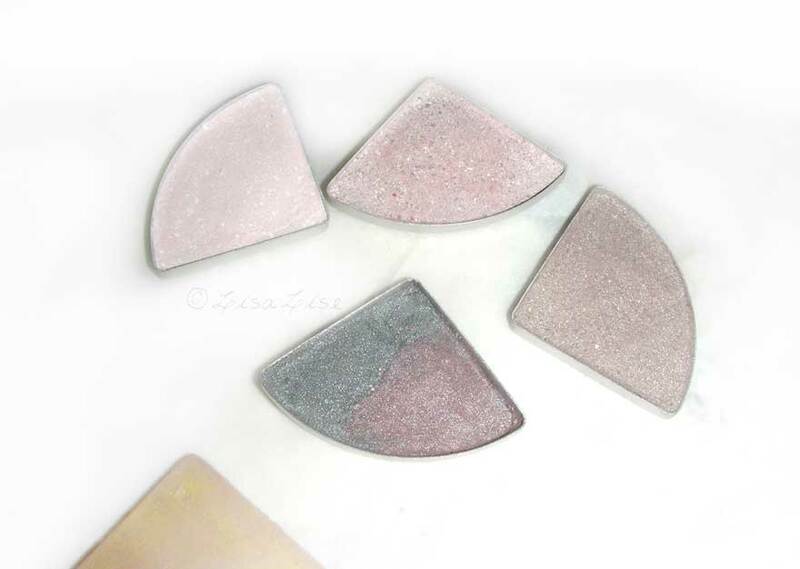 Transfer eyeshadow to make-up pan. A pressed eyeshadow needs to be built up in layers. Start with a thin layer, press, add more, press again. I find it is helpful for distribution to place a piece of wax paper between the press and the powder. If you're doing multiple colors (for a palette container), I recommend buying make-up containers that have metal pan inserts. The yellow, pie-shaped thing in the picture is a silicone mold I made (with Amazing Mold Putty) that fits into the pan and makes it easier to press evenly. Unless you are working with a 1-color container, it's much too problematic to press directly into a plastic container. Keep adding and pressing. Experience has taught me that it is very important to press a lot and build up slowly if you want the shadow to stay in the container and not loosen when you start using it. When I've built up enough layers, I will do a final pressing with this cool make-up vice I bought recently. 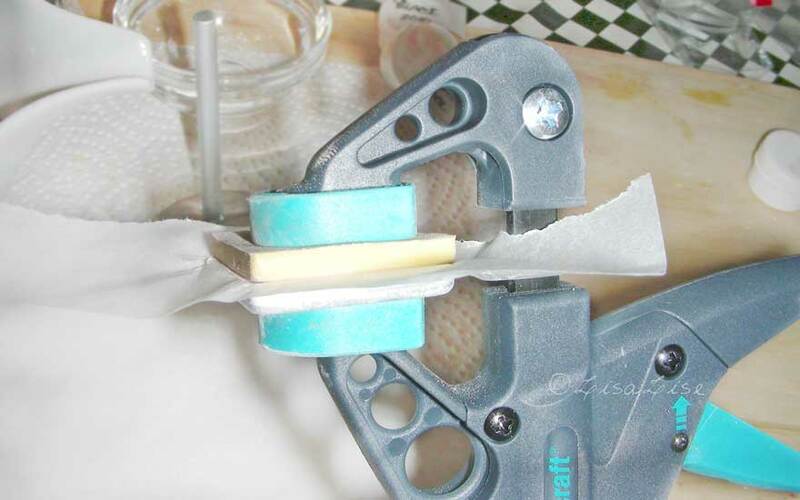 Sandwiching the silicone mold and wax paper between the vice creates a good surface for an all-over, even result. When you can lightly tap the edge of the pan against a hard surface without powder flaking up and falling out, you've pressed enough. Here are the 4 final pans of shadow. One has a mix of 2 different colors – just for fun. Now it's just a question of transferring them to the final container. The pans are spot-glued into the final container. See top picture for the finished product. My technique is a bit different - I use a lot of alcohol and instead of jojoba I use silicone oil - lasts longer (wet pressing). Do you also press glittery eyeshadows? I find them very difficult to do - very crumbly. And as I add more of the liquid binder it becomes disgustingly greasy. Yes, I press glittery eye shadows and have no problem with them at all. I use the jojoba as the binder. 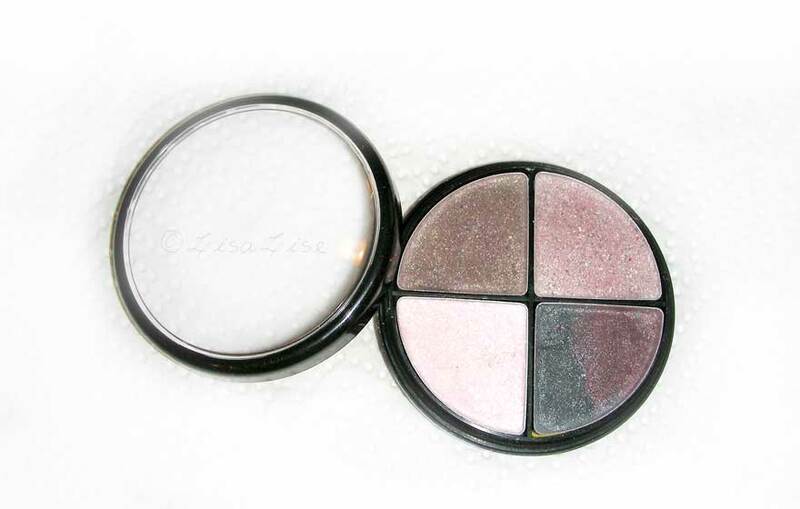 Do you get any irritation from using your eye shadows? This combination of alcohol and silicone oil is not very skin friendly. How exactly are you using the alcohol? Hello! What type of a vice is that, I love it! Hi Lise! I too love your vice I tried to fine the site you gave but it's in French did you find a English site? About how much is the device? yes the site is in French, but have you tried going through Google Translate? That should help. The price for the vice is 5,5 Euros (about $8). I can highly recommend these folks. They have great service and are very dedicated to what they are doing, so, go for it! Hello!great post...did you use the DIY press base in this photo.Also whats the ratio of jojoba to powder?? Hey there. Yes, for this session I used DIY's base. Sorry, but I don't know their ratio of jojoba to powder.